It’s easy to be impressed by the world of contemporary supercars. Kinetic energy recovery systems, computer-activated downforce mechanisms, designs as bold as Donald Trump’s comb-over, and literally thousands of horsepower. 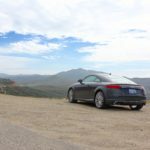 It’s hard to wrap the mind around what’s happening in the upper-echelons of automotive engineering. But as remarkable as supercar development has become, the reality is that the vast, vast majority of the consuming public will never even touch one of these mythical beasts, much less own and drive one. 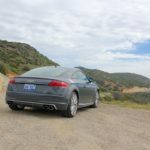 So is the middle-class man or woman who might crave an engaging driving experience, innovative features, and aesthetic pleasures doomed to a life of automotive misery? 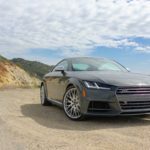 Without ever experiencing Audi’s new TT-S sports car, I still would have argued that there’s hope for enthusiasts among the latest crop of entry-level performance vehicles, but after a week with the German automaker’s third generation coupe, I pity the fool who says modern thrills only exist in the land of supercars. 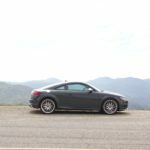 For most sports cars, development time and money is tangibly conveyed primarily through the driving experience, but with Audi’s 2016 TT-S, the fun starts on your way into the cockpit. 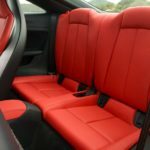 The cabin is a rich blend of brushed metal, quilted leather, and soft fabric. 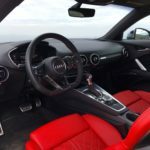 The gorgeous sport bucket seats are designed for grand-touring comfort as much as corner-carving, but you may even forget where you are once you’ve engaged the coupe’s red Start/Stop button and meet Audi’s Virtual Cockpit. 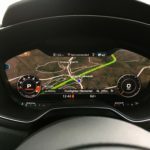 The 12.3-inch driver display was introduced on the new TT and is now being rolled out to other models like the redesigned Q7 SUV. 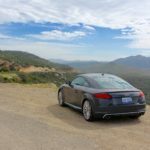 In the two-door coupe, Audi has forgone an additional dash-mounted infotainment system, and while that might sound like a gip, the truth is that you’ll never miss the extra screen. 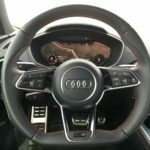 The interior is unified in its driver-orientation, from the way the center stack is pivoted towards the pilot to the steering wheel-mounted controls (you can adjust nearly every vehicle setting and access all convenience features without ever taking your hands from the wheel). The layout is efficient and intelligent. 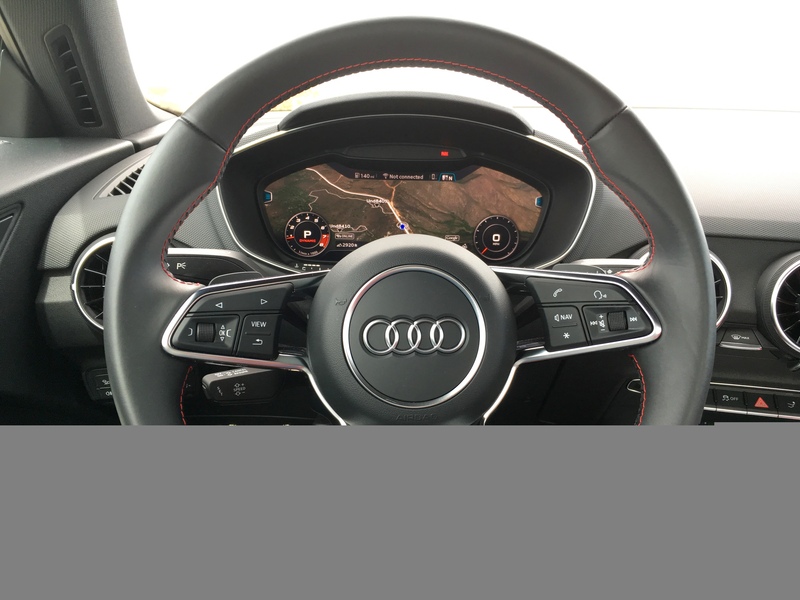 Instead of cramming the center stack with buttons or relying on touch-feedback for everything, the TT-S is equipped with toggles for the most essential controls and shortcuts, plus a center dial where you can scribble directions to the navigation system one letter at a time. 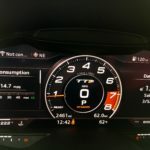 The fully configurable display can prioritize a stunning Google Earth map, large tachometer and embedded speedometer, entertainment options, or vehicle information like fuel economy and tire pressure. 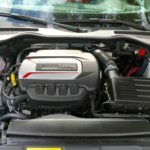 At first, the breadth of information is difficult to process, but after a few rounds at the helm, it’s possible to locate any bit of data without taking your eyes off the road. 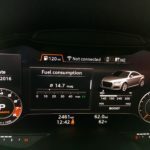 Even without a head-up display, Audi’s Virtual Cockpit is easily one of the safest and most intuitive systems I’ve ever toyed with. Put simply, when you’ve experienced technology like this, analog dials and convoluted infotainment systems don’t just feel outdated, they feel wrong. 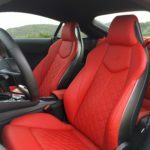 As revolutionary as its interior might be, you mustn’t forget that this is, after all, a sports car; there are performance standards to uphold. 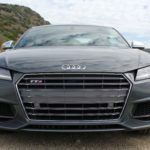 Fortunately, Audi’s renowned Quattro all-wheel drive, 292 turbocharged horsepower, and 280 pound-feet of torque are all good indicators that fun is on the way. 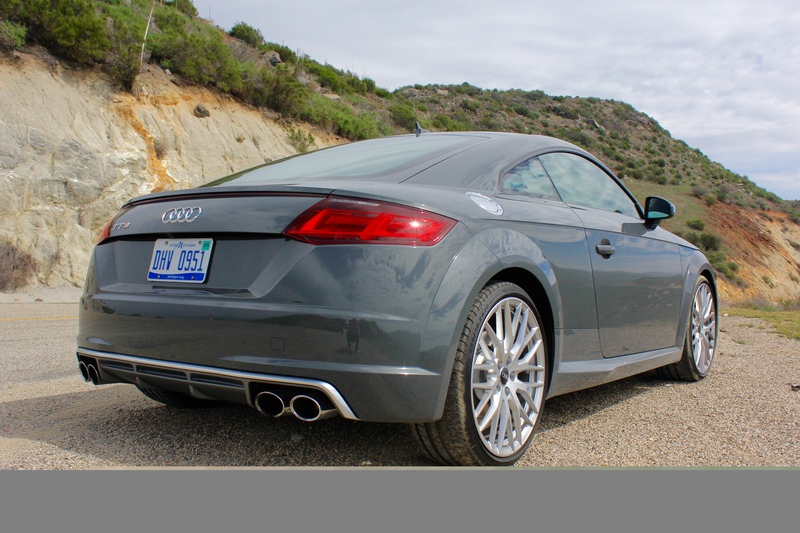 More importantly, the TT-S weighs just 3,230 pounds, which means it can rocket to 60 mph in just 4.6 seconds. 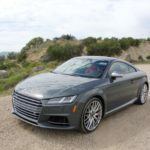 Forget the numbers, though – the real treat is taking a corner at whatever speed your lizard brain will allow, and feeling your jaw descend as the TT-S grips, and hunkers, and braces, and then catapults you out the other side in stable precision. 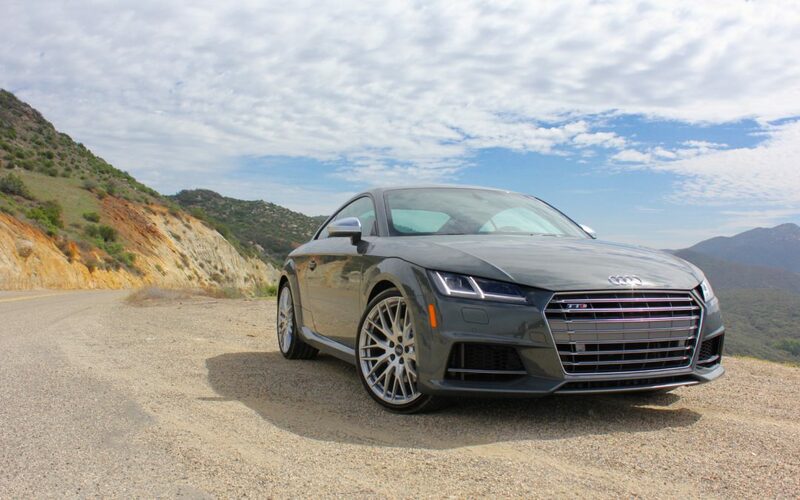 Like other modern Audis, the TT-S comes equipped with four drive modes: Comfort, Auto, Dynamic, and Individual. While all are fairly self-explanatory, Individual is actually multiple settings in one. 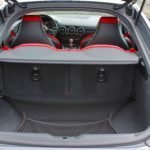 Within the category, you can modify steering weight, accelerator responsiveness, suspension stiffness, and shifting haste, independently. 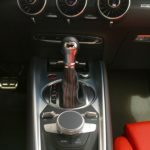 Beyond the Drive Select options, the gear selector can be dipped into Sport mode or docked into a manual shifting position. 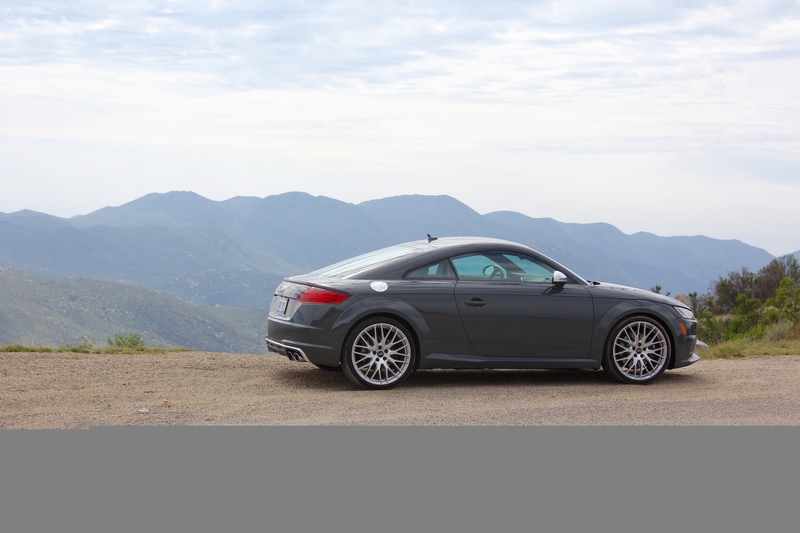 Left to its own devices, the TT-S prudently transitions between aggressive and casual driving. Should you wish to change gears on your own, simply pull a paddle while in any drive mode. As long as you’re aggressive with the throttle, the transmission will bend to your will. If, however, you return to a less enthusiastic pace, the automatic gear changes will resume. No need to apply any settings, just drive in whichever manor pleases you, and let the car diagnose your intentions. 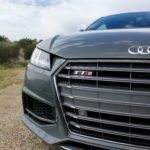 At the moment, Audi only offers its six-speed S-tronic transmission, but there’s hope that the upcoming TT-RS will be available with a stick. 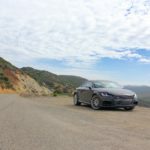 After riffling through every drive mode combination, I settled on the Comfort setting with Sport mode engaged for all but the most exuberant driving bouts (a.k.a. Dynamic conditions). In this calibration, the ride was supple while the acceleration and shifting was brutally quick. 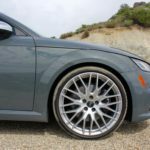 Unfortunately, the adjustable suspension couldn’t compensate enough for the 19-inch wheels on low-profile tires, which made certain road imperfections rather rough. 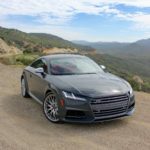 Complementing the TT-S’s world-class athleticism is, surprisingly, the engine note from Audi’s 2.0-liter TFSI four-cylinder. 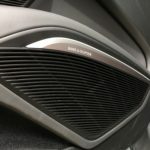 Whether electronically amplified or not, the mixture of force-fed induction and thumping overrun is one of the most luscious mechanical melodies I’ve ever heard – truly distinctive from the deep-bellied call of a V8 or the chorus of a six-cylinder. 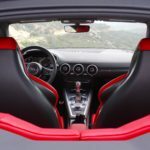 If the smaller-displacement sports car future is characterized by such a savory engine note, we have nothing to fear. 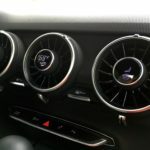 Daring design was integral to the TT’s inception in 1998, but the previous generation muted the drama. 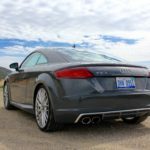 With Audi’s new corporate face, however – a wide hexagonal grille to match the TT’s razor-sharp character lines – the theater is back. 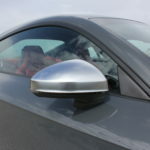 Elements of the original coupe, like its flared wheel arches and rounded hindquarters remain, but the overall physique is the embodiment of modernity. 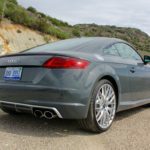 The “S” in TT-S also means a low-profile body kit, accentuated rear diffuser, and ornate blade wheel designs. 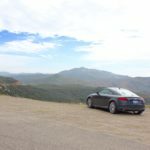 More than ever, the new TT looks like a micro-R8, which is praise beyond measure. One unfortunate drawback to the pronounced side rockers is how difficult it can be to maneuver out of the drivers seat without putting uncomfortable pressure on the back of the exiting leg. I did find that by kicking both legs out at the same time, it was possible to avoid issue, but I suppose there’s a price to pay for radical styling. 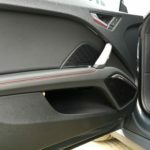 My tester came in Audi’s Nano Gray Metallic, which served as the perfect foil to an audaciously red Napa leather interior. 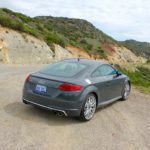 The milky surface may not have been as heroic as the available mustard yellow paint, but considering how rapidly the TT-S can exceed “sane” speeds, perhaps an incognito exterior is best. 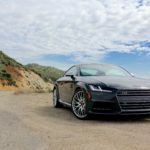 Audi has surely found its design sweet spot lately, and the TT sports car is the best way to achieve bold on a budget. 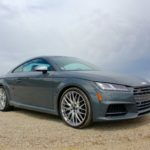 And speaking of, where does the TT-S fare in the search for performance value? 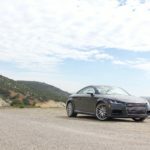 At $52,825 including destination, the extra 72 hp is a healthy bit more expensive than the base TT’s starting figure ($43,825), but I can’t think of a more complete package in this price range. 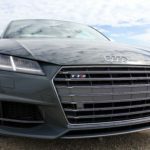 The vast majority of the car’s best bits, including its LED headlights and taillights, flat-bottom steering wheel, 12-way power S sport seats, and Alcantara-trimmed interior are standard features, but you will need to fork over an additional $3,250 for the full suite of tech goodies. 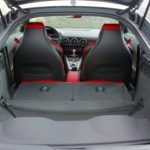 Though BMW’s M2 will retail for within a few thousand dollars of Audi’s TT-S and will offer similar performance, when it comes to sophistication, the Bavarian can’t compare. 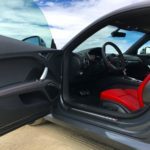 More importantly, I wedged four grown men into the TT’s cabin and they hardly complained; let’s see another compact two-door sports car manage that.